Otrivine Natural with Eucalyptus is natural hypertonic sea water with eucalyptus essential oil and extract of wild mint. It quickly provides natural relief from nasal congestion due to colds and rhinosinusitis. It also has a purifying action to clear the nasal passages and it helps to remove bacteria and viruses. Provides an immediate sensation of relief and freshness. Preservative free. 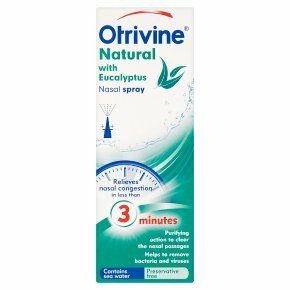 Provides effective, natural relief from nasal congestion (blocked or stuffy nose) due to colds by reducing nasal swelling.Otrivine Natural with Eucalyptus is a preservative free nasal spray containing natural hypertonic sea water combined with essential oil of eucalyptus and extract of wild mint. The undiluted solution also retains the richness of all the important mineral and microelements contained in sea water, such as calcium, iron and zinc. Otrivine Natural with Eucalyptus is a natural, intense nasal decongestant which: quickly relieves nasal congestion, provides effective, natural relief from nasal congestion (blocked or stuffy nose) due to colds by reducing nasal swelling, provides an immediate sensation of relief and freshness and has a non-drying effect, moisturising the nasal cavities. Dosage: For children over the age of 6 years old and adults: One spray in each nostril up to 6 times daily. Do not use for more than 7 consecutive days. Dosage For children over 6 years old and adults: One spray in each nostril up to 6 times daily. Caution, before use, carefully read the enclosed instructions for use.<br><br>Do not use during pregnancy, while breast-feeding, in case of allergy to any of the ingredients or in children below 6 years of age.<br><br>Keep the product out of the reach and sight of children.<br>Do not use the product after the expiry date or after 6 months of opening.